An examination, covering theories and concepts, of issues relating to definitions of hate crime, the individual and community impacts of hate crime, the controversies of hate crime legislation and theoretical approaches to understanding offending. 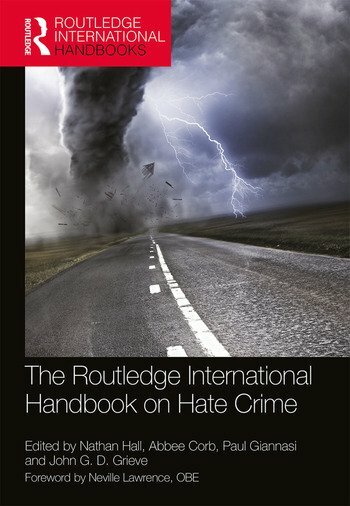 An exploration of the international geography of hate, in which each chapter examines a range of hate crime issues in different parts of the world, including the UK, wider Europe, North America, Australia and New Zealand. Reflections on a number of different perspectives across a range of key issues in hate crime, examining areas including particular issues affecting different victim groups, the increasingly important influence of the Internet and hate crimes in sport. A discussion of a range of international efforts being utilised to combat hate and hate crime. Introduction, Nathan Hall, Abbee Corb, Paul Giannasi, and John Grieve Part 1. Theories and Concepts 1. Framing the Boundaries of Hate Crime Neil Chakraborti 2. Beyond the Silo: Rethinking Hate Crime and Intersectionality Hannah Mason-Bish 3. The Personal Injuries of Hate Crime Paul Iganski and Spiridoula Lagou 4. Exploring the Community Impacts of Hate Crime Barbara Perry 5. Legislating Against Hate Gail Mason 6. Explaining Hate Crimes: sociological and criminological perspectives Nathan Hall 7. Explaining Hate Crimes: perspectives from the wider social sciences Nathan Hall Part 2. The International Geography of Hate 8. Hate Crimes in Europe Mike Whine 9. Hate Crimes in the UK Paul Giannasi 10. Sectarianism and Hate Crime in Northern Ireland Marian Duggan 11. Global Antisemitism Dave Rich 12. The European Extreme Right Emmanuel Godin 13. Hate Crimes in the United States Jordan Blair Woods 14. Hate Crimes in Canada Abbee Corb 15. A Governance of Denial: Hate Crime in Australia and New Zealand Nicole Asquith Part 3. Key Issues in Hate Crime 16. Hate Crimes against Disabled People Chih Hoong Sin 17. Disability Hostility, Harassment and Violence in the UK Paul Hamilton and Loretta Trickett 18. Alternative Subcultures and Hate Crime Jon Garland and Paul Hodkinson 19. Hate Crimes Against Gypsies, Travellers and Roma in Europe Zoe James 20. Reflections on Gendered Masculine Identities in Targeted Violence against Ethnic Minorities Loretta Trickett 21. LGBT Hate Crime Leslie Moran 22. Anti-Transgender Hate Crimes Jordan Blair Woods and Jody L. Herman 23. Good and Evil on the Internet Sol Littman 24. Online Hatred Sarah Rohlfing 25. Online Hate and Cyber-Bigotry: a glance at our radicalized online world Abbee Corb 26. Hate Crimes in Sport Nick Hawkins Part 4. Combating Hate and Hate Crime 27. Policing and Hate Crime Paul Giannasi 28. Intelligence-led Approaches to Combating Hate Crime John Grieve 29. Forensic Science and Hate Crime Paul Smith 30. You’re a Victim, Don’t Become an Offender: A Study of the ‘Moral Career’ of Racist Hate Crime Victims Corinne Funnell 31. Working with Offenders Liz Dixon and David Court 32. Rehabilitative Programmes for Hate Offenders Eila Davis 33. Repairing the Harms of Hate Crime: a restorative justice approach Mark Walters 34. Challenging Sectarianism Graham Spencer 35. Deradicalisation Daniel Koehler. Nathan Hall is a Principal Lecturer in Criminology and Policing at the Institute of Criminal Justice Studies at the University of Portsmouth. He is a member of the Cross-Government Hate Crime Independent Advisory Group (IAG) and the Association of Chief Police Officers Hate Crime Working Group. Nathan has also acted as an independent member of the UK government hate crime delegation to the Organization for Security and Co-operation in Europe, and is a member of the Crown Prosecution Service (Wessex) Independent Strategic Scrutiny and Involvement Panel, Hampshire Constabulary’s Strategic IAG, and the Metropolitan Police Service’s Hate Crime Diamond Group. Abbee Corb works as a consultant with the law enforcement and intelligence services within Canada and abroad. Abbee provides educational instruction to law enforcement and government agencies around the world and she is also a university professor. She has a PhD in Criminology and bears the designation of CMAS (Certified Master Anti-Terrorism Specialist). Abbee has been working in the field of hate and extremism for over 20 years and began her career dealing with Internet-based hatred and right wing extremists. She also worked dealing with Nazi War criminals for almost 10 years. Abbee is a court-qualified expert on hate and extremism, specifically as it applies to the online environment. She has produced three award-winning films dealing with hate crime, is a published author and is periodically called upon by the Canadian media and pro-active community-based organizations as a consultant on right-wing extremism. Abbee is also an expert on countering violent extremism and hate crime. Paul Giannasi is a Police Superintendent, working within the Ministry of Justice in the United Kingdom. He leads a cross-governmental hate crime programme which brings all sectors of government together to coordinate efforts in order to improve the response to hate crime from across the criminal justice system. Paul is the UK ‘National Point of Contact’ to the Organisation for Security and Cooperation in Europe (OSCE) on hate crime and has worked to share good practice within the OSCE region and within Africa. Paul is also a member of the Association of Chief Police Officers (ACPO) Hate Crime Group and is one of the authors of the Police Hate Crime Manual, which provides guidance to UK police officers and their partners. John G. D. Grieve joined the Metropolitan Police in 1966 at Clapham and served as a police officer and detective throughout London, in every role from undercover officer to policy chair for over 37 years. His duties involved the Drugs, Flying , Robbery and Murder Squads senior investigator. He was also the borough commander at Bethnal Green and head of training at Hendon Police College and was the first Director of Intelligence for the Metropolitan Police. He led the Anti-Terrorist Squad as National Co-ordinator during the 1996-1998 bombing campaigns and created the Race and Violent Crime Task Force. In the latter role he was responsible with others for the creation and development of the Cultural Change, Critical Incident and Community Impact models for strategic crisis management. He retired in May 2002.